OTOXA, Toledo, Mon. 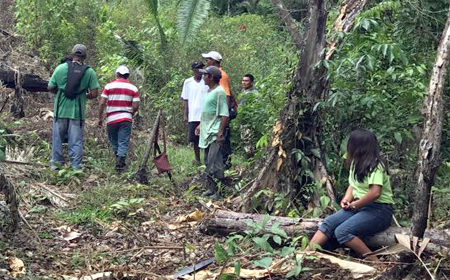 May 8, 2017–Amandala has received news that a group of Guatemala peasants have come across into Otoxa, in the Toledo District, where they were seen clearing land. The intruders reportedly told the villagers that they were making a border mark in Belize and claiming the land in the village. 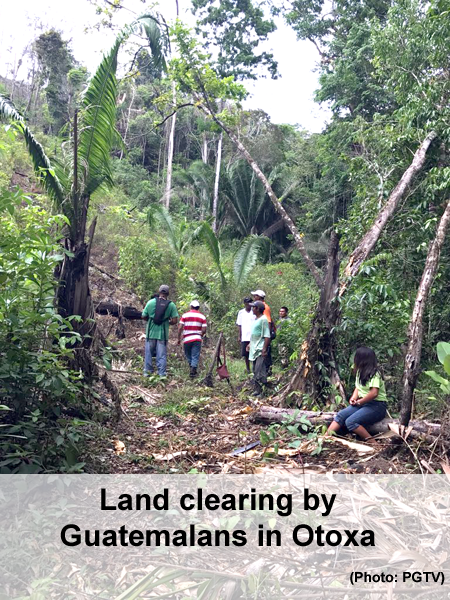 The village chairman and the village alcalde, along with the Belize Territorial Volunteers (BTV), went to the area to see what was happening, and saw the area cut and cleared by the Guatemalans. The incident occurred on Saturday. Wil Maheia, founder and leader of the BTV, who went to inspect the area for himself, said that indeed, the land had been cleared and a line had been cut to demarcate what the Guatemalans said they could take as Guatemalan land. The Guatemalans told the villagers that they were cutting the border on the Belize side to take land which they said is Guatemalan land. The problem is, however, that the land they have demarcated is part of Otoxa village. Mark Chen, the first alcalde of Otoxa, in an interview on PG TV, told Wil Maheia that at about 1:00 Saturday afternoon, he was at home in the village when he was informed that the lands near the village were being cut and cleared by the Guatemalans. He and the village police immediately went to see what was happening, and that was when he saw a line cut from the river’s edge straight to a hill, and he also saw some areas that already had been cleared. Chen said that those lands are in Belize. He made a report to one “Chicalte,” the alcalde of the neighboring Guatemala village, after which he went to Punta Gorda to report to the Maya Leaders Alliance, who directed him to go to the Belize Defence Force. The BDF said that they would be in the area on Wednesday.